Gravels are non-cemented sedimentary rocks composed of granules (2-8 mm), pebbles (8-32 mm), cobbles (32-64 mm), and occasionally even larger boulders. When cemented they are called conglomerates. Some old books call conglomerates by the poetic term “puddingstone” because of their fruit pudding-like appearance with different kinds of pebbles in a finer-grained matrix. 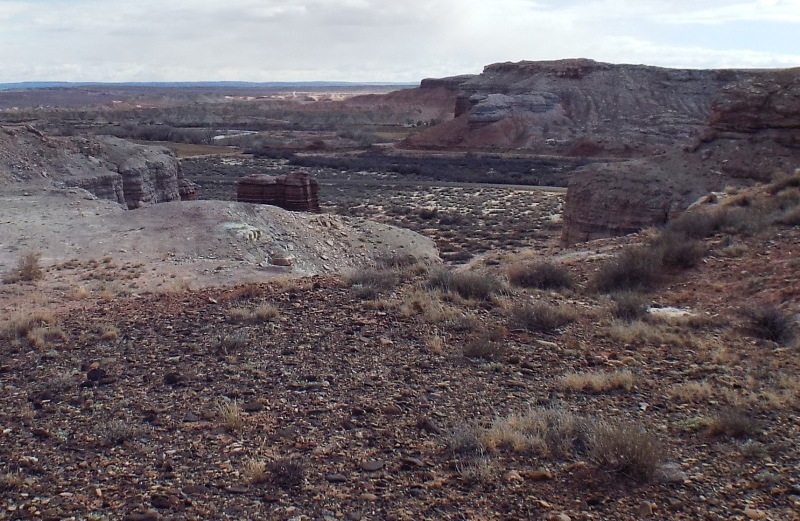 Valley of the Fremont River, just upstream of Hanksville. Gravel deposits once filled this valley to a depth of 100 m or more, and are still locally preserved as terraces, such as the those visible in the foreground. Gravels are common at MDRS. They are of interest to us for many reasons. We find hypolith colonies beneath them, some of the older gravel deposits have been colonised by lichens, and the gravels themselves tell us a great deal about both the local geology and the evolution of the landscape over the past hundred thousand years or so. 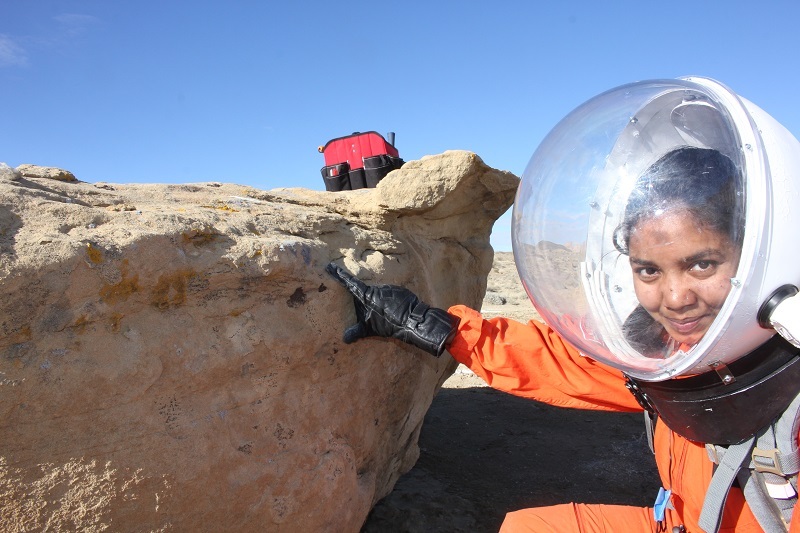 Anushree examining a Fremont gravel terrace for hypoliths during an EVA. Some gravels are associated with the major streams in the area, like Muddy Creek and the Fremont River, and contain pebbles that have been transported for tens of kilometres. Others are more local in origin, consisting of pebbles derived from the weathering of the Jurassic and Cretaceous conglomerates. The most significant and most studied gravels in the area are those of the Fremont River. The valley of the Fremont has been repeatedly filled with gravels and then exhumed, leaving gravel terraces along the sides. Some of these are more than 100 m above the level of the river mean that this amount of gravel has been deposited and partially removed repeatedly during the last 150,000 years. Gravel deposition and removal is associated with climate change, principally the glacial and interglacial cycles. 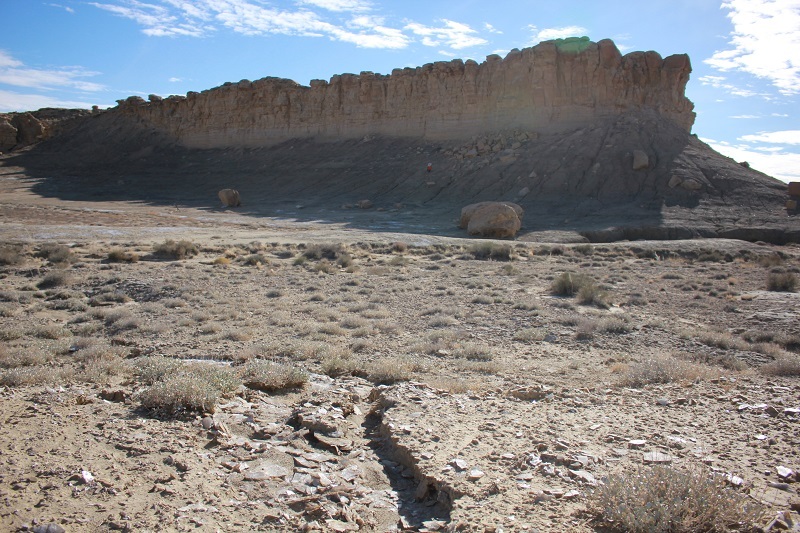 Transport and deposition of gravel occurred during glacial epochs, when glacier deposited large amounts of eroded material in the catchment of the Fremont, while erosion ocurr3d during the warmer interglacial epochs, such as the present. Fremont gravel surface. End of stick is 2 cm across. 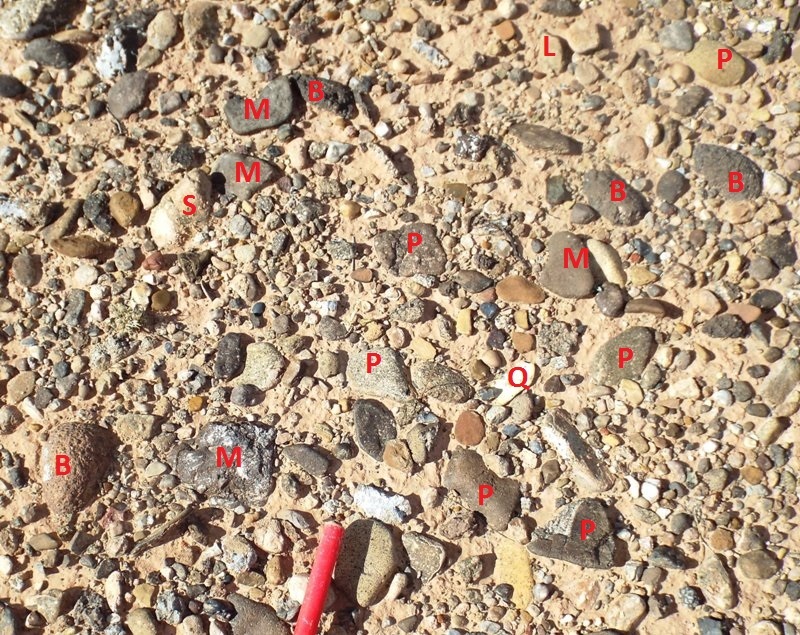 Some cobbles and pebbles are identified as: B = basalt from Aquarius Plateau, M = metamorphosed sandstone from Henry Mts, P = porphyritic dacite and diorite from Henry Mts, Q = quartz, S = un-metamorphosed sandstone, L = limestone. This gravel is composed of rocks eroded from the upper reaches of the Fremont River to the west or transported from the Henry Mountains to the south down to the Fremont River by alluvial fans. They are mostly composed of contact-metamorphosed and porphyritic dacites and diorites from the Henrys, basalts from the Aquarius Plateau and a range of other rock types, include cherts from the Capitol Reef area more locallyderived sandstones and conglomerates, along with jasper and quartz. 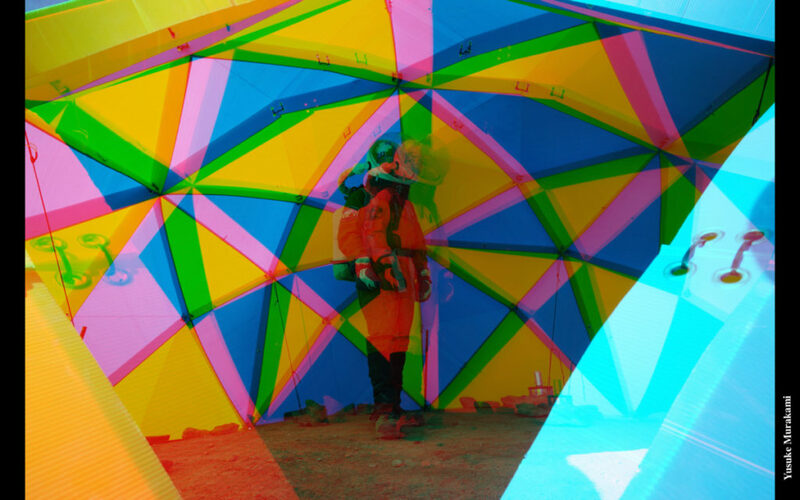 These last two are of uncertain origin as they are often extremely angular. Some jasper may be from petrified wood. 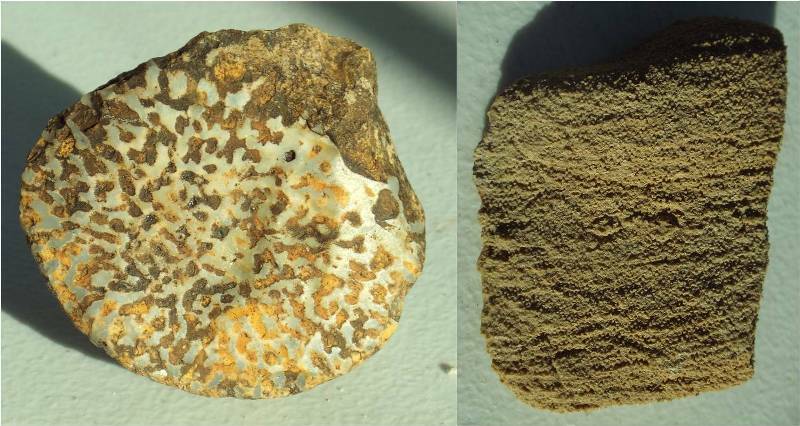 A few pebbles contain Permian fossils from the Kaibab Limestone, such as sponges, or are composed of oolitic limestone from the Triassic Sinbad Limestone Member of the Moenkopi Formation. These diverse rocks allow us to glimpse the geology outside the areas we are able to access. By comparing the rocks with Google Earth imagery and published geology maps we can locate their sources and discover how far they have come. 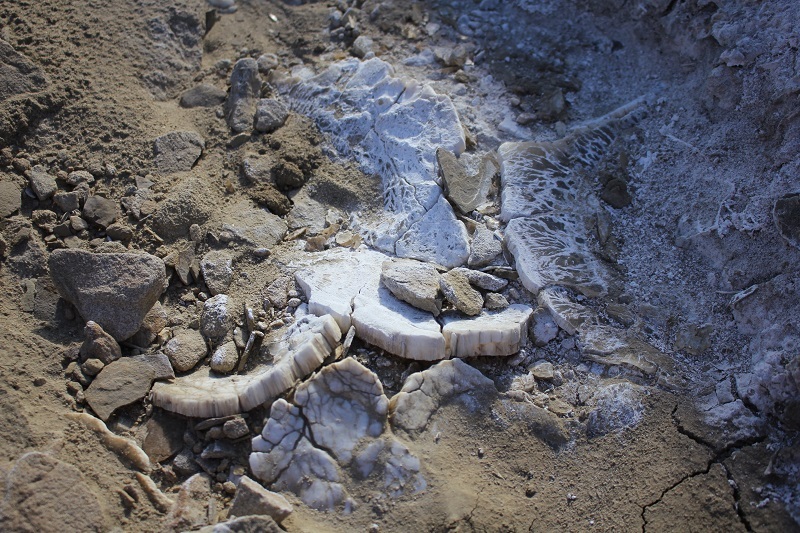 So the sponges (and other marine fossils) tell us the Kaibab Limestone was deposited in a marine environment of normal salinity, hospitable to a range of marine life. The ooids, which are small, rounded grains of calcium carbonate, tell us that the Sinbad Limestone formed in shallow, agitated water saturated with calcium carbonate. They are found today in places like Great Salt Lake in Utah, the Bahamas, the Persian Gulf, and Shark Bay, Australia. 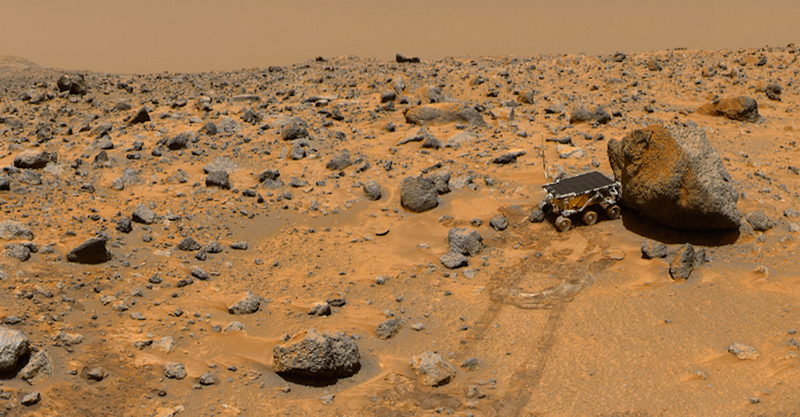 Cobbles and boulders probably transported down Ares Vallis at the Pathfinder landing site (NASA image). We also find gravels on Mars. The Pathfinder mission landed in the lower reaches of the Ares Vallis drainage system. The mission obtained images of a surface deposit of cobbles to boulders that had probably been transported down Ares Vallis billions of years ago. Some of the rocks were founded and others were imbricated, that is that were resting against each other. 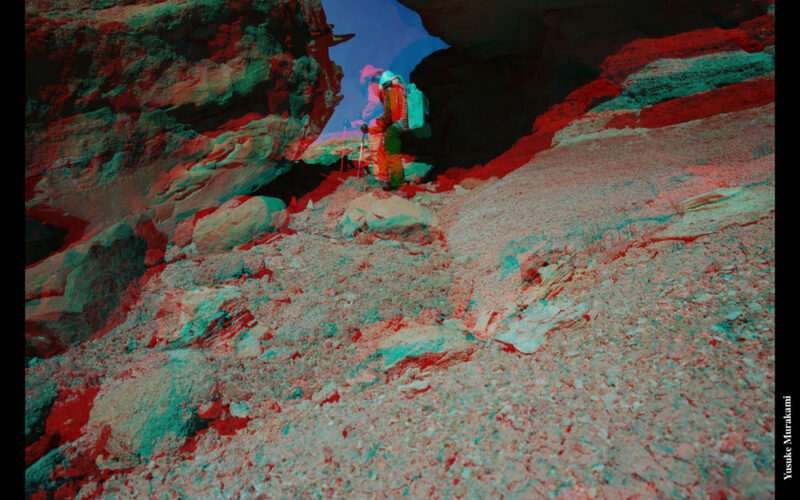 Imagery by the Pathfinder lander and geochemical data measured with the Sojourner Truth rover showed that these deposits are compositionally diverse, just like those of the Fremont River. 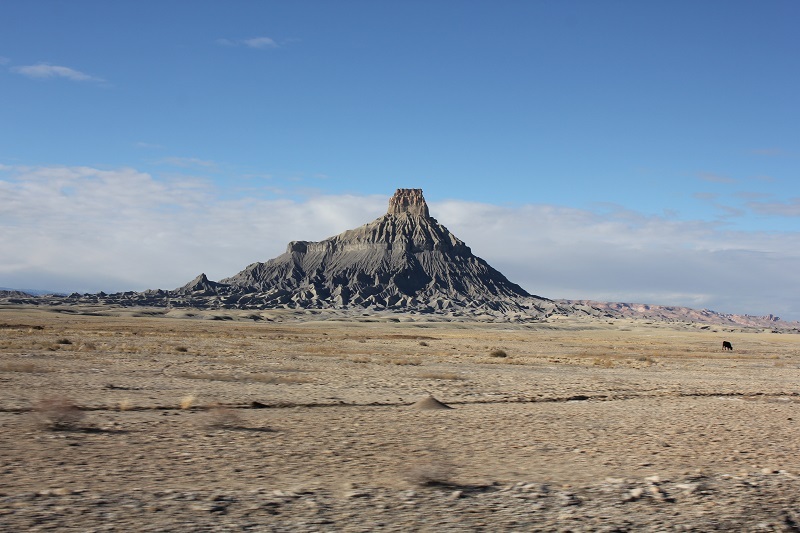 The rock types included possible conglomerates, basalts of three different spectral classes, and a more silica-rich volcanic rock called andesites. These different rock types provide us with an idea of the geological diversity upstream of the Pathfiner landing site. 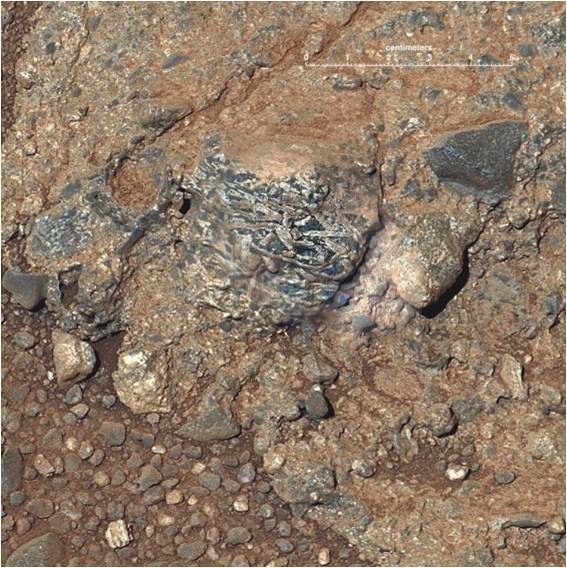 Granite pebbles in a conglomerate imaged by the Curiosity rover mission on the floor of Gale Crater (NASA image). The Curiosity rover mission imaged a number of conglomerates on the floor of Gale Crater. 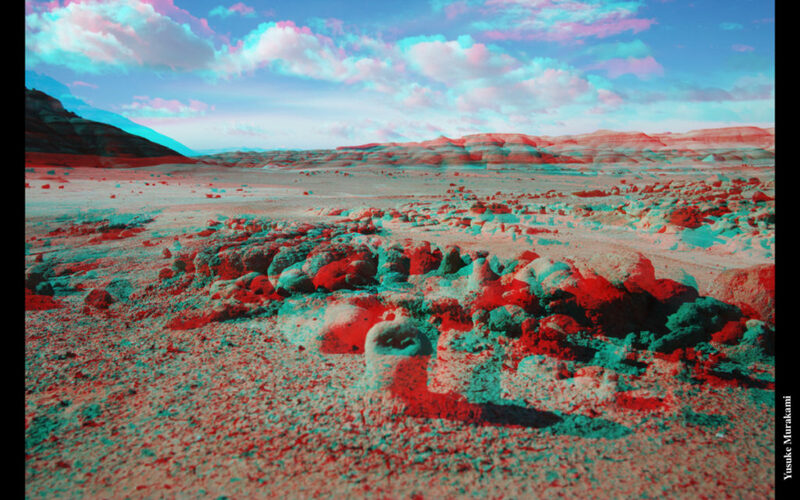 These were deposited in alluvial fans and were derived from the surrounding high ground.. The mission scientists were able to infer the composition of the ancient rocks of the martian highlands exposed on the crater rim. Most importantly they included rocks of near granitic composition, hinting that the martian highland crust was much more geologically evolved than had been thought hitherto, and supporting the idea that something like terrestrial plate tectonics may have operated during the earliest martian epochs. 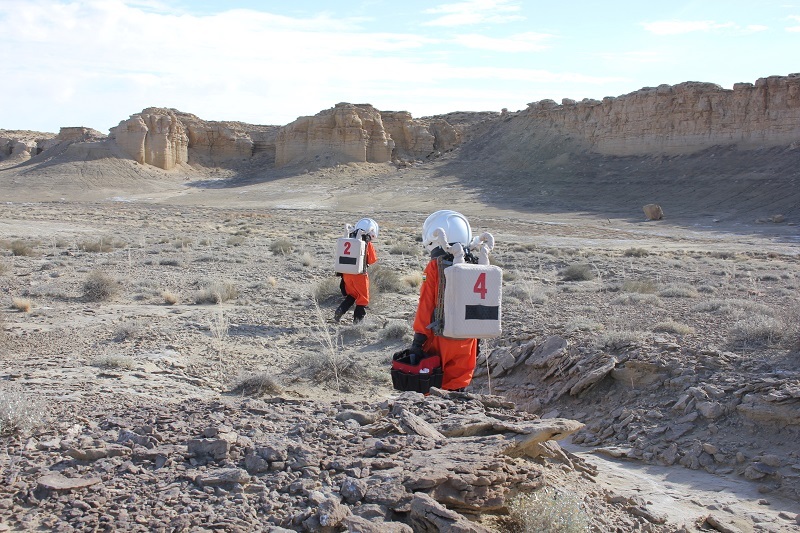 Future Mars explorers may also examine gravel deposits for clues about the geology outside their exploration area, or of locations that are otherwise inaccessible, such as at the tops of steep cliffs. 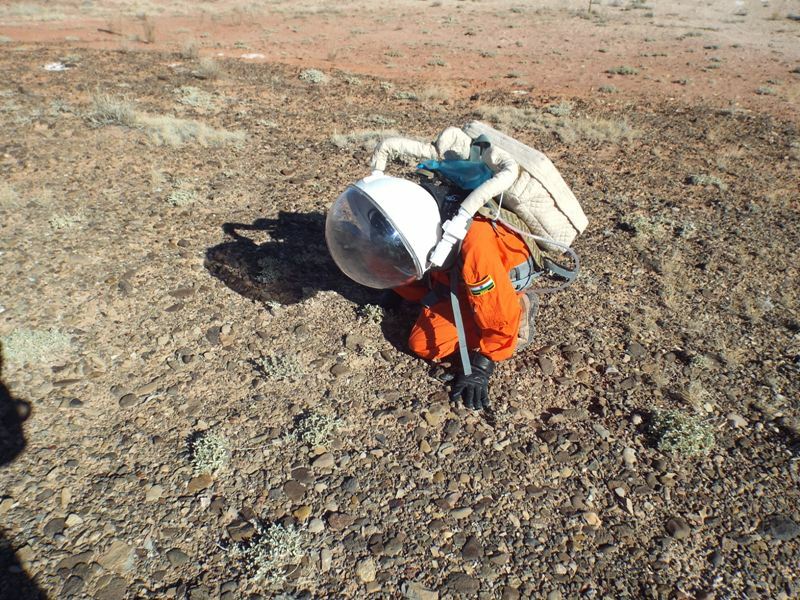 They too will study their distribution to understand martian landscape evolution, and perhaps look underneath them, as we do, to see if there are any microbes sheltering in projected microenvironments. Understanding the nature significance of gravels is an important tool to the scientific exploration of Mars. Summary Title: The first day of December. 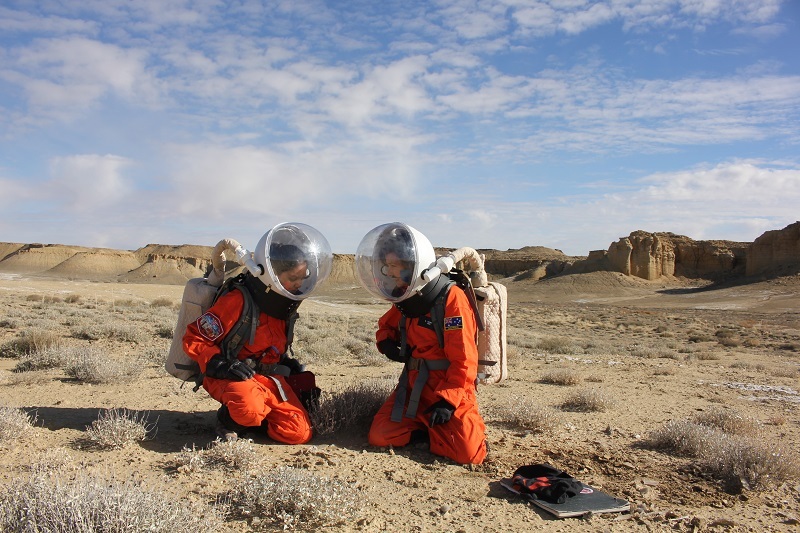 Today Anushree, Anastaysia and I went out on an EVA for hypolith sampling. 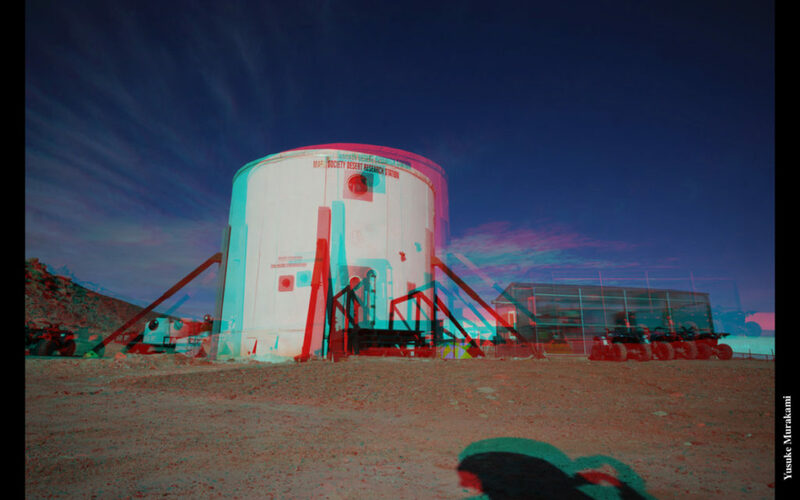 It was very chilly but for me it was one of the loveliest field trips ever, in spite of a number of anomalies. We had our lunch in the Pressurised Exploration Vehicle aka the Ford F150. Then we took soil samples for halophiles and found hypoliths in a field of sparkling gypsum. I spent most of my time half way up the cliffs drawing honeycomb weathering on sandstone boulders that have been colonised by my favourite black lichens polysporina cyclocarpa. (so happy, if only I could do this every day). 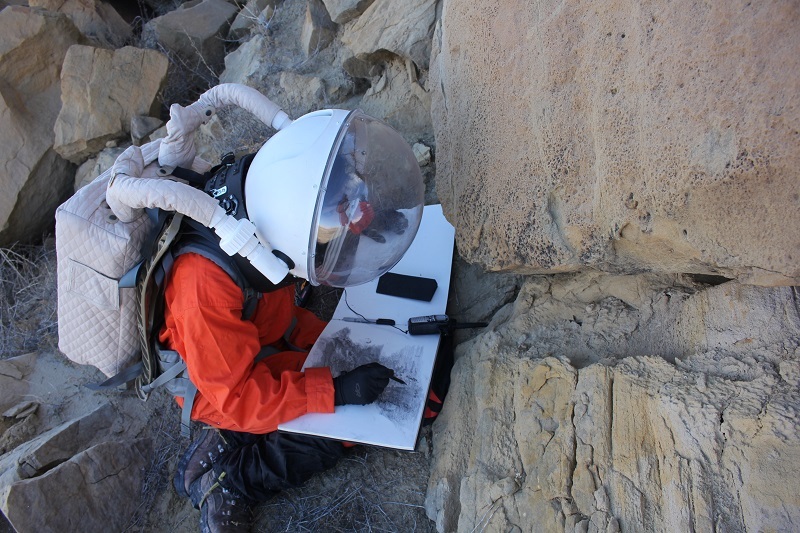 On our return I gave my drawing to geologist Jon to annotate as blind data. Meanwhile at home, Deimos, our second electric rover arrived. And XO Yusuke was Acting Commander today. This afternoon he worked on a 3D drawing of our hab. Claude-Michel worked on plants and wrote reports. 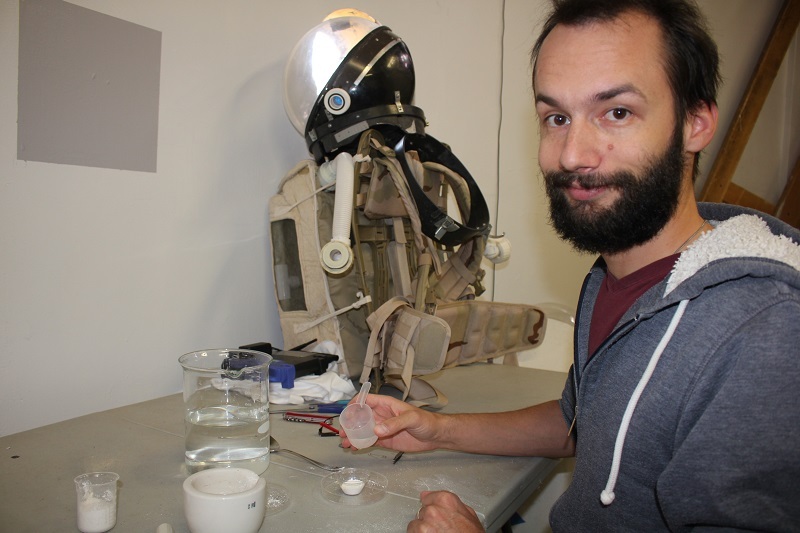 Alex worked on his spacesuit interface and wrote up yesterday’s oddity as a report (see Alex’s post on this unusual circumstance). Jon Clarke worked on petrography, looking at fossil sponges and oolitic limestones (and please see Jon’s report on gravels.) Quite a few of us have showered now and everything is smelling great, including Jon Clarke’s pasta dinner. Early night. Plans for tomorrow: Indoor day tomorrow processing samples all day. Crew Physical Status: Excellent. Clean. Weather: Very chilly, no wind. Anomalies: Something green is growing up through the sink hole in the bathroom.